Lateral view of a 3D volume-rendered reconstruction of the hemipelvis with the femur removed. 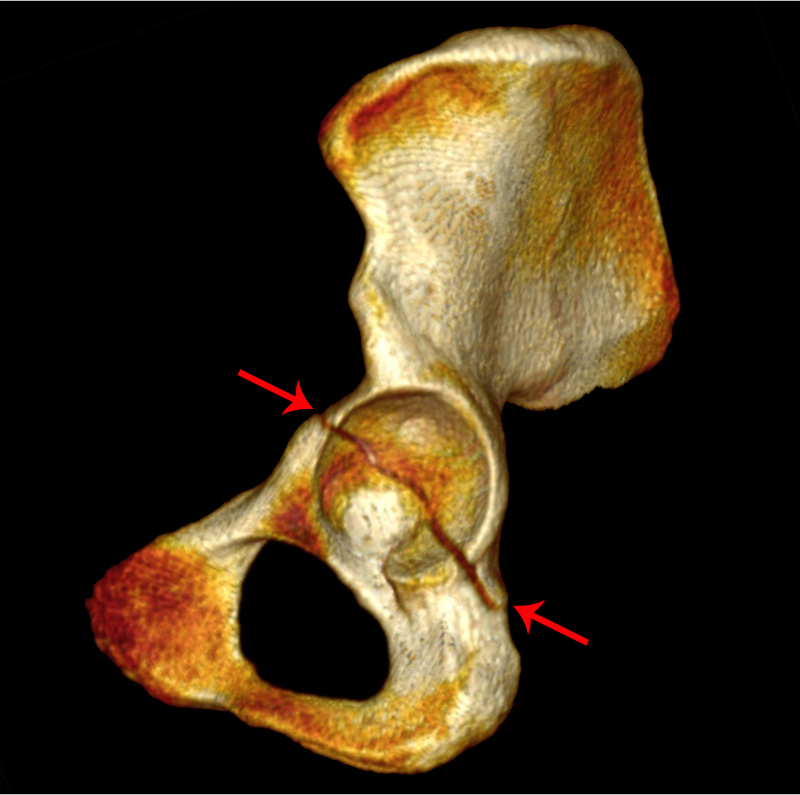 Red arrows denote a horizontally-oriented fracture dividing the acetabulum into superior and inferior halves. Axial CT image of the pelvis through the left acetabular tectum. 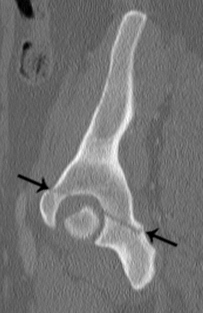 Black arrows denote a sagittally-oriented fracture plane through the acetabulum. 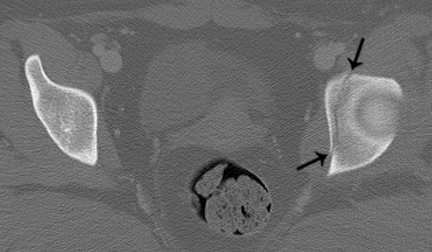 Axial CT image of the pelvis through the sacroiliac joint. The iliac wing is intact. 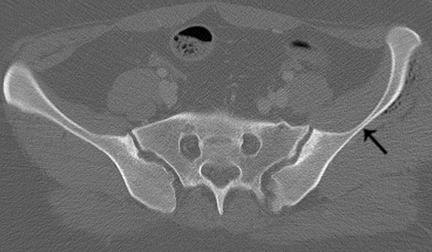 Axial CT image of the pelvis through the left ischiopubic ramus. No fracture is seen at this level. 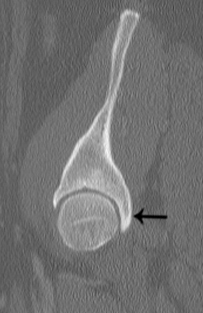 Sagittal CT image through the acetabulum, lateral to medial. Black arrows denote a horizontally-oriented fracture through the acetabulum not involving the iliac wing or ischiopubic ramus. Sagittal CT image through the acetabulum, lateral to medial. The posterior wall is intact. True transverse acetabular fractures represent approximately 10% of all acetabular fractures. The fracture plane travels horziontally through the hemipelvis, disrupting the iliopectineal and ilioischial line, and separates it into superior and inferior fragments. 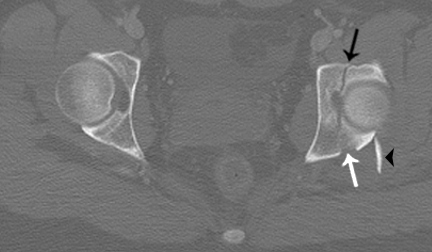 However, unlike the both column fractures, transverse fractures do not involve the iliac wing or ischiopubic ramus. There are two variants of the transverse pattern. If the posterior wall is also involved, then it is the transverse-posterior wall fracture, which is actually more common than the isolated transverse pattern, representing approximately 20% of all acetabular fractures. Alternatively, if the transverse fracture has a component that extends down into the ischiopubic ramus or ischial body/tuberosity, then it is the T-type variant, which represents approximately 6% of all fractures. Axial CT image through the acetabular tectum. 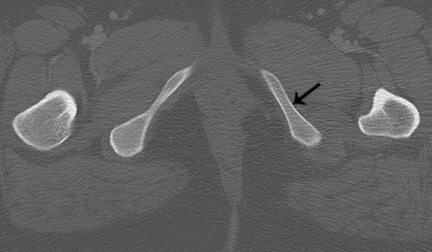 Black arrow denotes a sagittally-oriented fracture plane, white arrow shows an oblique fracture of the posterior acetabular wall, and black arrowhead indicates the displaced posterior wall fragment, consistent with a tranverse-posterior wall fracture.